Welcome to Sight Matters - the home of independent advice for all things related to your sight from respected optometrist Dr Tony Hanks OAM. We many helpful FAQ sheets to download. 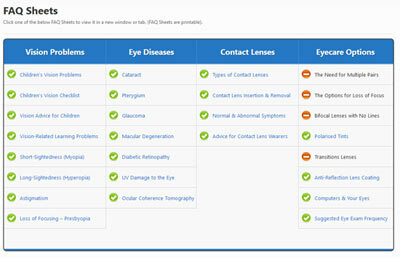 Sight Matters is your source of reliable information about your eyes and vision. The resources on this website have been especially developed to help you understand the changes that can occur in your eyes and the best options for treatment if needed. Vision & Eye Health Answers to questions about cataract, glaucoma & many other conditions. Useful Links Suggested further reading, resources and information from our sponsors. Eyecare Plus Optometrists Eyecare Plus is a selected group of independently owned and clinically driven optometrists across Australia. Copyright © 2011 Sight Matters and CHWD - All rights reserved.